Let’s give this another go! It’s been five Ludum Dare Jams with SynthGuitar since I last participated and here we are again. I made sure that the weekend is free to focus all the time on Ludum Dare. Let’s begin! As per usual the first idea that pops into my head is some platformer, but as the past has proven, making a platformer from scratch in the given time frame is quite tricky, especially since I’ve never implemented a fully working platformer. Not putting the idea right off, but maybe there are more interesting things to go after. The plan right now is to first get some sleep and in the morning brainstorm a bit in what ways “room” can be interpreted and how far one can stretch the definition of “one”. Here’s a cute dog picture just because dogs are awesome! Get in touch with me on Twitter. Don’t miss the streams on Twitch and Livecoding.tv tomorrow! All it took was to tweet a convincing gif of my game directly to the wonderful @Brendy_C, so in case you want your game covered by press it probably is a good idea to directly address people. Graphics! I’m using Piskel and Photoshop. I think there’s a bit of an late-70s arcade feel. Added a third bullet, the white bullet cannot be absorbed by either colour phase so it should be avoided at all costs. Few more bullet behaviours added in for difficulty. Save data added, game will save the longest time for each difficulty. Now the name on this title screen isn’t the final name, I’ve been struggling to come up with a good name so I’ve been asking around. I’ve now got four names I like and I’m letting the twitter folk choose the best one, so if you want to pick a name vote now before time runs out! Perhaps not a fantasy monster either. Something many people view as a monster, but is actually quite cute! A shark! That’ll show those evil monster folk how it’s done! 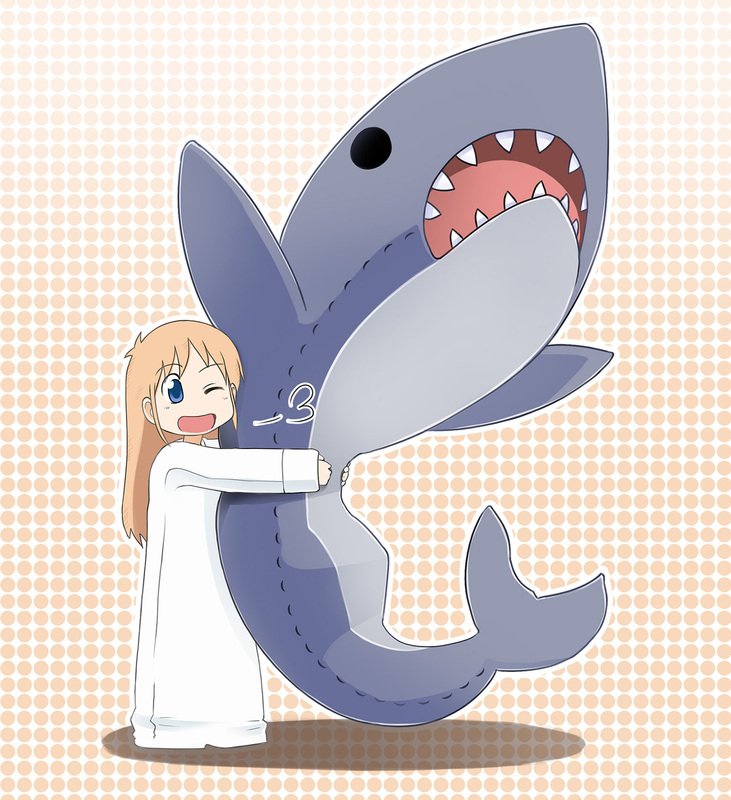 So my game is about a hungry shark, hence the name, Same no Kuufuku! So uh, we’ll see if that turns out to be useful. “Oh My Oilrig!” is rapidly shifting gears on its post-compo journey towards becoming a full-fledged Android game. While waiting for the release, here’s a sample of the new variety of enemies: a terrifying archer who will cause aggressively mediocre damage to your precious oilrig! BWAHAHAA!! The first release (I’m aiming for Sunday!) will have nine different enemies (three submerged, three on-the-surface and three airborne) and a variety of different defense towers (a slingshot and “ye olde cannon”, to name a few! ), coupled with active and passive on-board upgrades (shields, radar, drill boost…), not to mention overhauled interface. If you’re interested, keep an eye on my Twitter feed (@dManabreak) for updates. Also, feel free to tweet and comment if you have ideas, critique or anything! MINIMALISTIC TURBO Now on Charity Jam! Hey guys! Just finished up an amazing Jam where the point is to link a button in your game to a charity of your choosing. You may have heard of it as we have all been talking about it for a few weeks now here on LD. Anyway, my game is called MINIMALISTIC TURBO and I am very proud of how this turned out. This was my first game with a menu, sounds, actual graphics, and I really am just really glad with how it turned out. I think what I enjoy most is the tight controls, gameplay, and how there are very few bugs, no really, I gave this to my testers and they couldn’t find anything that was actually a bug. A few small tweaks, but no game breaking faults. This is pretty big, if you remember my last LD game, a text adventure that was pretty buggy and more often than not break for testers. I am still pretty proud of the text adventure, it was really big for me at the time and still is pretty complex, anyway, that just shows how much I have grown. Something else I added in this game were sounds I haven’t really had any experience with sound in games, I mean, I had played around with some stuff, but this was my first game that really embraced that and did it well. Anyway, all in all, I am really proud I was able to do this, and I hopefully helped the Red Cross along the way. Wanna play my game? You can look for it here, or download the game. Use the hashtag #MINIMALISITC_TURBO to tweet about my game! Or, follow me on the twittertwaters (@powderblock) for live tweeting late night fun. Just a quick post to let Ludum Dare raters and reviewers know about Ludum Legacy, a twitter bot set up to post one LD48 game every hour. There are so many games, this takes us into August – the time of the next Ludum Dare! This was my first Ludum Dare and WOW! What an experience. I aimed for more than I could chew when I embarked on my game “Life/Routine” and thought “I’ll submit this for the Compo”. Having never finished developing a complete game, let alone on Unity, I knew the odds were stacked against me. On top of it, I had real-life obligations which included a Senior Year project seminar on Saturday and birthday dinner on Sunday. If that weren’t enough, my home PC internet went off for almost an entire day. But I’m not here to boast. I’m simply here to express my excitement. LD26 has been a brilliant experience. Reading through the #LD48 tweets and seeing the excitement among devs — many of which were first-timers like me has been some experience. It is true when someone said that “Excitement is contagious!” because the LD48 fellow co-participants’ struggles and little victories sure inspired me to finish this game by the Compo deadline. A minimalist “dynamic rhythm” game. Life/Routine captures the duality of a life built around their daily routine. It describes both the calming beauty and the overwhelming claustrophobia that comes when you run the hamster wheel of the mundane routine. It captures the very essence of “familiarity” created by our own actions and how we can either fall in an endless pattern of a life of same beats or break free from it. You either create objects or destroy them. The objects will give out specific sounds when they touch the bottom of the screen and they become part of the pattern and repeat after a short point — very much like your daily routine. You can choose to either revel in the mundane and try creating your own sounds from the “pattern” or break free from it by destroying it and choosing a life that suits your comfort level. The difficulty is entirely dependent on the player and their actions in creating/destroying objects will dynamically adjust the difficulty. Creating more objects results in more sounds and a more vibrant routine/music pattern but also makes the game difficult and more overwhelming(music can turn into noise). Every “life” has a specific course and will end after the “life bar” on top has been filled and the life has been lived. — No overlying narrative/explanation of concept. Everything that needs to be interpreted is conveyed through the gameplay concept. The music and the art have been created by me. This is just to tell you that I have recently created a Twitter account, @jorjongames. Feel free to follow me! I will only tweet about game development. Why would I follow you? Hey, I’m not forcing you if you don’t want to. I made a couple of games for Ludum Dare, and I wish to someday make a feature-complete game. But I also love making tools for other to use, and I have posted them here before. Can I have a kittens animated gif? Progress! The main menu and connectivity is done. Now for the randomly generated stuff and game itself. In case you wonder, this started from the idea of books being tiny worlds. Then somehow went into Twitter, with writing smaller than any other. This will be my first game jam, and hopefully also my first non-mod, non-prototype game. Warming up, which will essentially be testing out tools and techniques I don’t have enough experience with. I’ve been using Unity for 2 years now, and I still like it. Luckily I have a Pro version that I can use, which has some nice new features like pathfinding, an awesome particle system tool and of course dynamic lightning. Not sure if I will use any of those, but it’s good to have. Unity comes with MonoDevelop, Unity is partly integrated with it, the auto-complete is nice and I’m used to it, so I will be using it to code my C# scripts. Sound, and therefore music, is the only thing I have no experience with, so I will have to practice it a lot before I start. I also have to find some nice VSTs which I can use. I do know something about music so I hope I can produce something worthy. When I have to do something with sound, which rarely happens, I use Audacity. I will probably be recording sounds with my smartphone and/or laptop microphones, and I know how to remove things like noise with this tool. Also editing and looping sound works pretty nice with this free tool. I love Photoshop, I have been using it from time to time in the past 10 years, I’m far from a pro but I know my way around in it. And, most importantly, it works really awesome with my Wacom. I usually use 3ds Max for 3D modelling, but I only have a student license for this, so I use Blender as substitute. Since the new interface I no longer really hate it, but I do not have a numpad on my laptop… Anyway, I want to try to make a 2D game, so I won’t use it extensively. Otherwise I will have to fall back to good ol’ 3ds Max. I always work with music on. (Unless I’m doing hard mathematics) I usually listen to a few styles, sorted by requirement: For creativity: death metal, progressive metal and prog. rock. For speed: drum ‘n bass, deadmau5 (yes, that’s a genre) and industrial. For inspiration: minimal classical music. And for relaxation: Eddie Vedder, Foo Fighters, Muse, or any of my other favourite bands, that no longer need attention (because I know every single tone). Everyone seems to do it, so I will do it as well. Also: I love timelapses :). For my warm-up a theme generator gave me a (cliché-ish) theme: Post-Apocalyptic Steam Punk. But I vowed to use it so I will. Basic idea: A 2D sidescroller where you have to use nuclear waste to mutate plants, animals and NPCs in order to solve puzzles involving steam engines. Don’t know if I have enough time for something like this, but I want to go through the whole process once so I might make one short level, without tutorial. I will post it when it’s done, if it’s done. One last thing: Good luck and above all, have fun, my dear opponents! Hi people! As I approach the end of day one, I thought I’d say hi on the LD blog. My game is called “Ghost Town” (working title). I’m seeing tons of amazing stuff on the LD page, this is incredible. I’m looking forward to watching everyone make amazing games this weekend. I have a request: please connect with me so we can encourage each other to do amazing things! Be sure to post tons of screenshots on twitter using the #screenshotsaturday and #LD48 hashtags. Hey, just scrolled through a dozen pages of posts, collecting people on Twitter like Pokémon, and I noticed that a few had entered the entire Twitter URL into the field on their Ludum Dare profiles. You only have to put your Twitter name in the field, with or without the @. Hi jammers! It has been super exciting seeing your progress even at this very early stage. Just wanted to put out a friendly reminder to everyone who uses twitter: post screenshots and tag them with the #screenshotsaturday hashtag so that users can see your wonderful creations in their twitter streams as well as the community website www.screenshotsaturday.com made by our very own pekuja. Keep up the awesome work! You guys freaking rock. 23 queries executed in 0.117 seconds.